Located only three minutes by foot from Yoyogi Uehara station, Concerto is tucked away in the basement of a building along Inogashira Dori. What stimulates your curiosity and assures you that you are going into the right place is the piece from a wooden pupitre placed on the concrete wall outside. A pupitre is a special hinged rack used in the traditional Champagne method to hold bottles at various downward pointing angles during Remuage, the process of removing the fermentation sediment from the bottle. 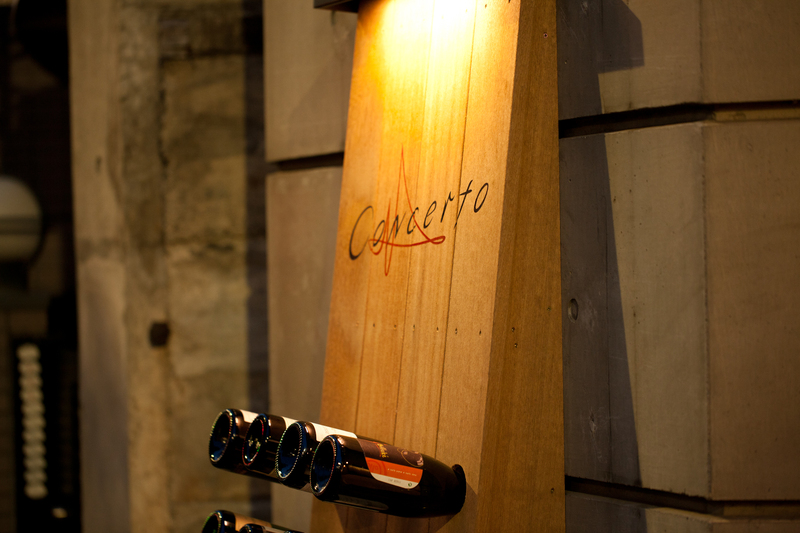 Outside of Concerto, this pupitre rack holding actual bottles used as an entrance sign communicates that this is a place to enjoy wines with a good meal. This restaurant is, however, not simply for drinking wines merely for the sake of talking about wines. This is a place to have a good conversation with your friends over a good meal and wine. Or, if you are by yourself, it is a place to relax and enjoy being yourself with your favorite dishes and wines. Simply put, this is your home away from home. You may feel inclined to use Concerto as your own extended dining room or living room. If you are with your friends, you can take a table and order a bottle of wine or two and a couple of dishes to share. Or, if you are by yourself, you can take a seat by counter and order whatever you feel like eating, along with a couple of glasses of wine. Takayuki Iguchi, the owner and chef of Concerto, is quietly humble. According to him, there are likely many places serving more sophisticated food, and having more extensive wine lists than Concerto. However, there are not so many restaurants In Tokyo equipped with the combination of good food, a good wine list, warm service and welcoming atmosphere as Concerto. Iguchi is a chef capable of solid Italian cuisines, even though he is still relatively young. He has worked at very well known Italian restaurants which you probably have been to or hope to go to sometime. He has worked at some of them as the chef in charge of the kitchen or entire restaurant. He opened Concerto in Yoyogi Uehara with two staff he worked with at his previous restaurants. At his restaurant, even though he dishes up solid Italian fare, he does not like to constrain himself within the category of Italian food. He simply enjoys cooking good food, especially that which goes well with good wine. Therefore, the range of food you might taste at Concerto is borderless. So are the wines available from the list. As the owner of the restaurant, he tries to have his customers feel as relaxed as possible to dine. To do so, he is not afraid of doing things unconventionally. For example, none of the people working, including himself, wears a chef’s jacket. Instead, they simply wear aprons over their casual attire. In fact, if you dine at Concerto, sooner or later, you start feeling as if you are at your friend’s house. This is the kind of place you will like stopping by every time you feel hungry on your way home after work. Conveniently located near Yoyogi Uehara startion, Concerto is not merely a place for you to enjoy good food and wine. It is a place for you to rekindle yourself. Concerto is an ideal place to drop by after your work or shopping, to enjoy Italian inspired dishes from the restaurant’s a la carte menu. 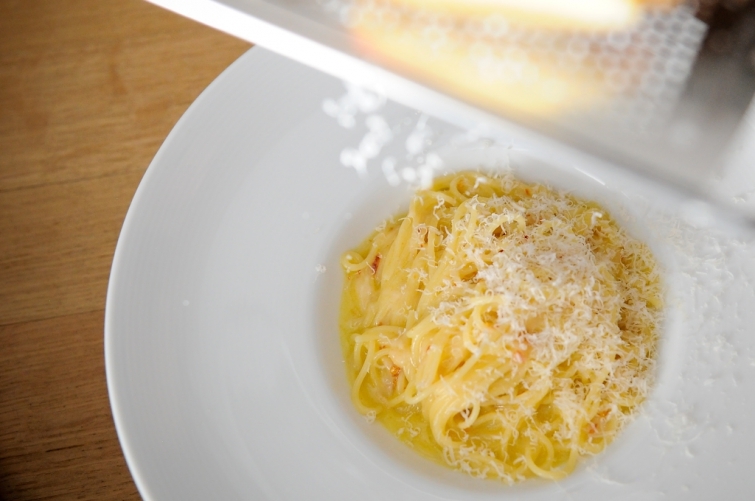 The menu features more than ten pasta dishes including very popular “Spaghetti with Fine Pepper and Parmigiano Reggiano”. Those pasta dishes regularly on the menu are all priced 2,000 yen or less. The restaurant sometimes offers a limited period only item with special ingredients. Ten appetizers including “Concerto Style Salad with Chicken Breast and Poached Egg, Topped with Parmigiano Reggiano” and “Lightly Seared Scampi Spice Flavored” on the a la carte menu are also priced 2,000 yen or less. It is great to know that almost all of appetizers are available half portion for half the price. Fish and meat dishes are priced 3,000 yen or less except “Wagyu Bistecca Steak” which is 3,600 yen. Desserts such as “Concerto Style Tiramisu” and “Cheese Cake” are all 800 yen. Concerto also offers two Chef’ “Omakase” set menus. 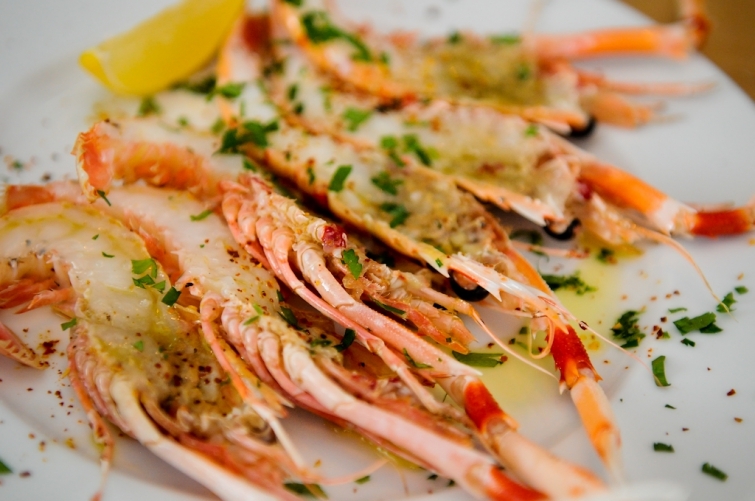 The same a la carte menu is also available on weekends and national holidays. 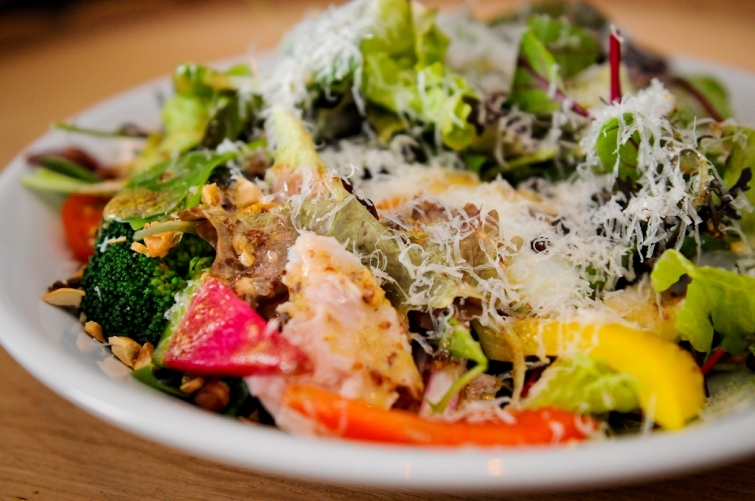 Even better is that the dishes are more reasonably priced for lunch. As Concerto serves international dishes based on traditional Italian cuisine, its wine list is very international. It includes wines from Italy, France and elsewhere in Europe. It also features new world wines as well. The majority of wines, including sparkling ones, are very reasonably priced at around 5,000 yen, so that you and your friends can casually enjoy wines by the bottle. You can even find two Champaign priced at 6,000 yen and 7,000 yen. However, they are not selling only affordable wines. What you really should notice are their wines priced over 6,000 yen. At Concerto, the wines are not priced based on their cost percentage. Instead, they set their selling price by adding almost the same amount of money to their buying prices. This means that you can often see wines priced as low as you see them in wine retail shops or even cheaper sometimes. By the glass, 3 red wines and 3 white wines priced less than 1,000 yen are available daily. Champagne by the glass is very reasonably priced at 900 yen. Please pay by cash if the total amount for dinner is less than 10,000 yen.